I was recently introduced to a lovely new small-batch skincare brand, made only four hours away from me! 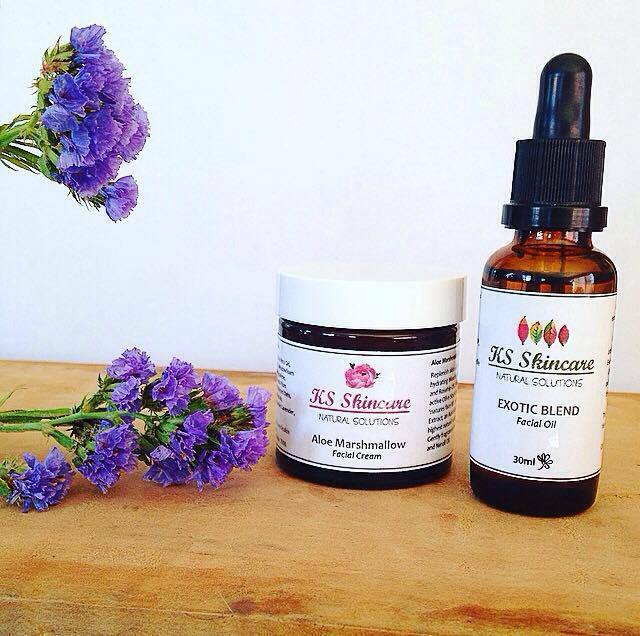 KS Skincare is lovingly made by Kimberly Scanlan in Tasmania, Australia. 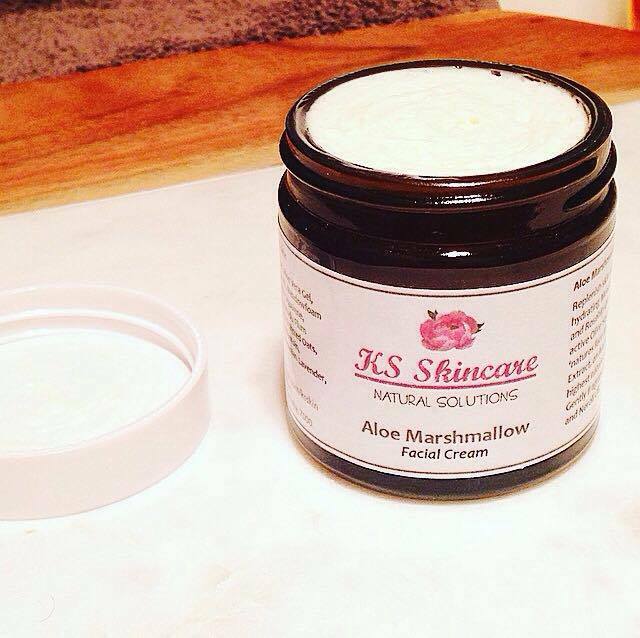 KS Skincare is 100% handmade, natural and filled with high quality and organic ingredients. Each product is formulated with a specific skin type in mind, as different ingredients have different benefits and there is no perfect 'one size fits all'. 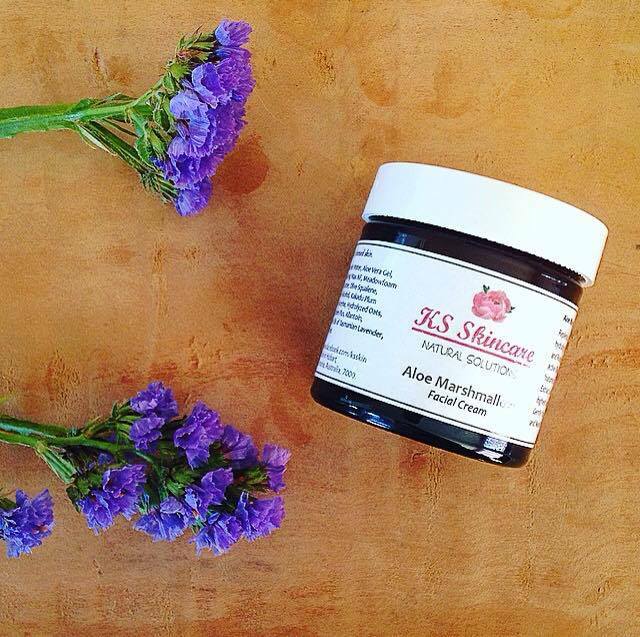 KS Skincare products are filler-free, and the prices are affordable. Kimberly does not believe in marking up products just because they are natural. She believes that luxury and natural can go hand in hand, and that organic does not have to be expensive. Kimberly graciously sent me a package with a few of her goodies inside. 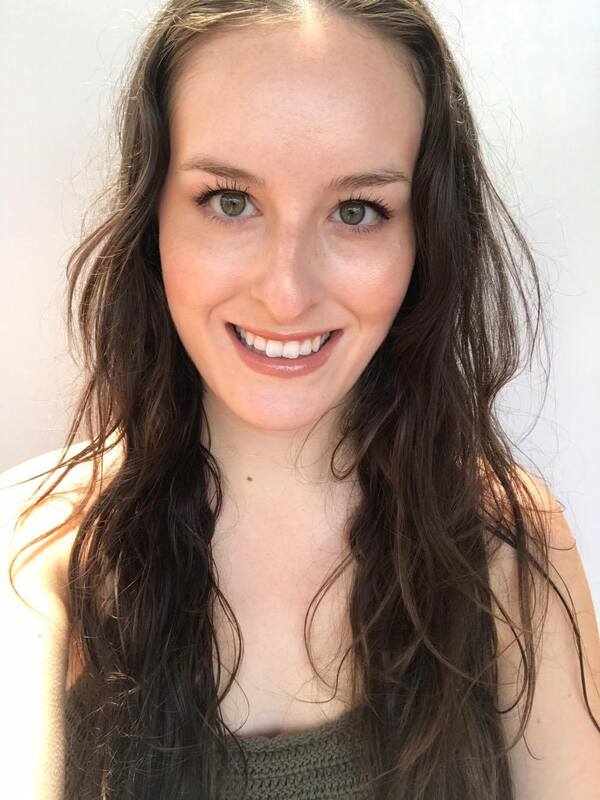 I have had the pleasure of testing out the Aloe Marshmallow Facial Cream and the Exotic Blend Facial Oil for a month now, and would like to share my thoughts now with you guys. I was most excited to try out this face moisturiser. It contains a plethora of my favourite skincare ingredients, so I was fairly sure I would love this one. Aloe Marshmallow contains Kakadu plum; one of my favourites for being an Australian Native, containing the highest natural source of vitamin C and increasing collagen production. Kakadu Plum also acts as a natural Alpha Hydroxy Acid to increase cell turnover and create fresher, clearer skin. Aloe Marshmallow also contains avocado oil, which is naturally high in vitamins E, A, B1, B2, and B5. It is high in antioxidants and has a softening effect on the skin while reducing age spots. Kokum Butter was recently added to this cream for its ability to regenerate skin cells and slow down the degeneration of healthy ones, making it a powerful skin healer. Aloe Marshmallow also contains meadowfoam seed oil for its antioxidant and skin softening properties, rosehip oil for its scar and line reducing properties, and olive squalene; also known as a natural face-lift in a bottle. Ingredients: Chamomile Water, Aloe Vera Gel, Avocado Oil, Emulsifying Wax NF, Meadowfoam Seed Oil, Aloe Vera Butter, Olive Squalene, Rosehip Oil, Cetearyl Alcohol, Kakadu Plum Extract, Vegetable Glycerine, Hydrolyzed Oats, Kokum Butter, Optiphen Plus, Allantoin, Vitamin B5, Essential Oils of Tasmanian Lavender, Neroli, and Carrot Seed. I love the texture of this cream; it is airy and whipped and you can hear the tiny bubbles pop as you scoop product out of the jar. The name of this cream really fits the texture. If I had to describe the texture I would say it is like a light marshmallow! It has a light lavender scent. I am usually not a huge lavender fan but this scent is not overpowering at all and I actually love it. I apply this cream with freshly washed dry hands to my skin after applying my day or night serums. It is quite a thick cream but it isn't oily or greasy. I take care not to apply too much to avoid white streaks. This cream is recommended for dry or mature skin, and as someone with dry, acne-prone skin, I find it to hydrate my skin beautifully, without breaking me out. This moisturiser leaves my skin soft and happy, and I have been reaching for it over my other potions. This oil is proof that you don't have to spend hundreds of dollars on facial products. Although I review many face oils, from the affordable to the expensive, I know that cost is the driven factor in many purchases as not everyone has an unlimited budget for skincare. 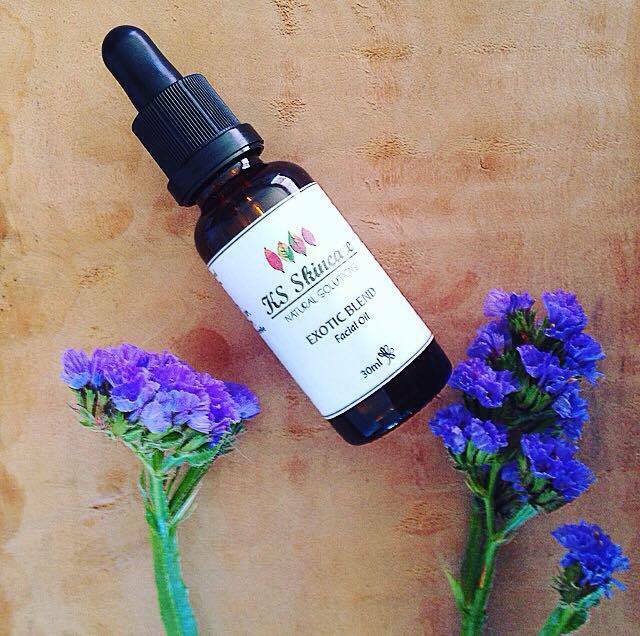 This facial oil contains exotic oils such as camellia, moringa, borage, evening primrose and argan. I have seen brands with serums containing the same ingredients selling for 3X more than KS Skincare sells for. Camellia, one of the oils in this blend, is known as the Geisha's secret. It aids in the penetration and fast absorption of this facial oil. Camellia is high in oleic acid; a fatty acid highly moisturising and restoring to mature skin. Evening Primrose and Borage oil both contain high levels of linoleic and gamma linoleic acid, critical for healing conditions such as acne and eczema. Moringa is amazing for skin as it contains over 1700 antioxidants and is one of the most nutrient dense oils in the world. It has also been used by the Indians as a treatment for acne. 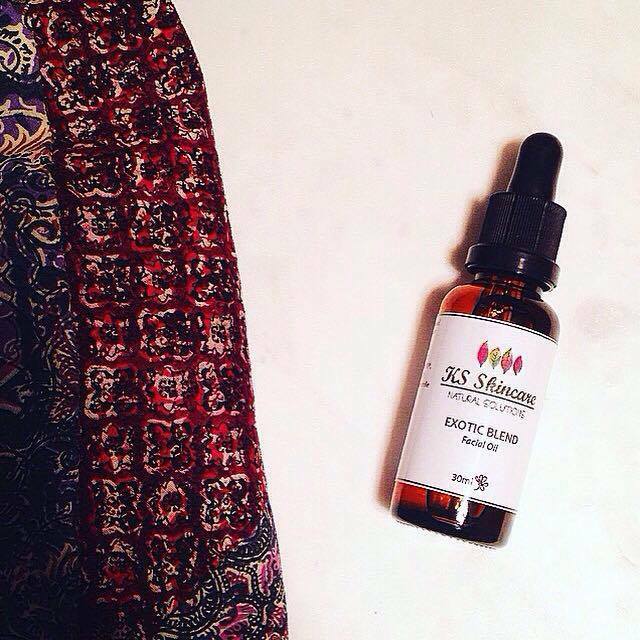 Exotic Blend would not be complete without Moroccan Argan oil. Argan is capable of repairing the skins water-lipid layer to deeply hydrate the skin, healing UV damage, and is highly beneficial to the treatment of skin conditions. Ingredients: Evening Primrose Oil*, Moringa Oil, Camellia Oil*, Borage Oil*, Argan Oil*, Essential Oils of Pink Grapefruit and Chamomile. The smell of this oil is simply divine! It contains chamomile and grapefruit essential oils, but the scent makes me nostalgic for a sweet candy I have had in the past. It smells delicious! I use this oil after I moisturise, to lock in the benefits of my moisturiser and moisture. This face oil is designed to bring balance to all skin types, and I find it really hydrating. I use probably five drops for my entire face, but those without dry skin can use less. It gives my skin such a healthy glow and is helping heal my acne scarring. I would also like to mention that Kimberly also included a lip balm in her package. It is not for sale as of yet, but when it is I recommend that you snap one up! It is the most hydrating lip balm I have tried in a long time, and heals like no other. It features ingredients such as beeswax, honey, cocoa butter and coconut oil. 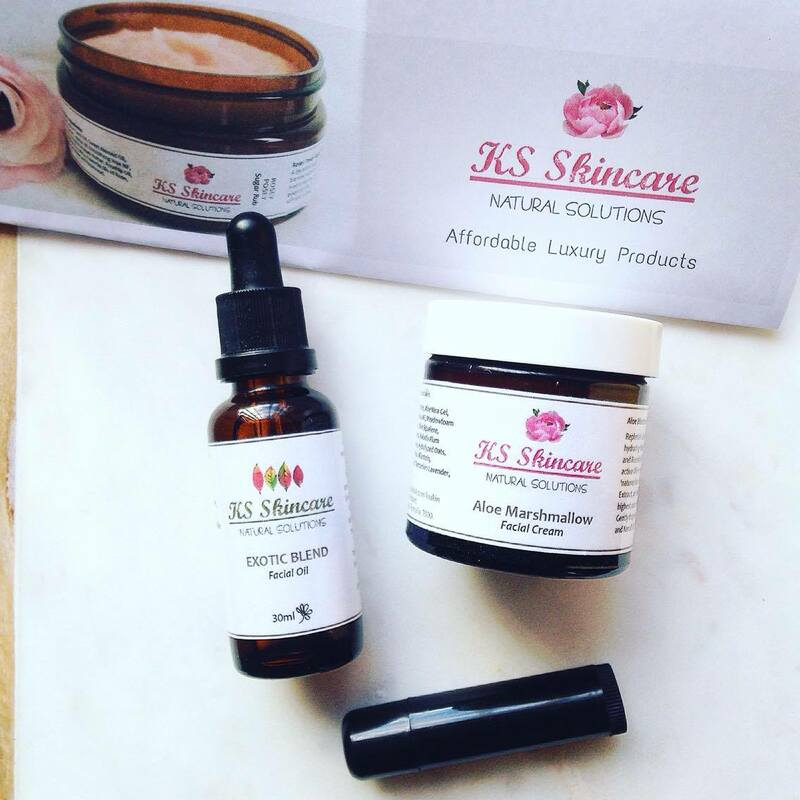 I highly recommend checking out KS Skincare whether you are new to natural beauty or a seasoned green beauty follower. You can visit her store here. You have done a good job to review the products from Skincare Laboratories. I too love to use their products as these products are gentle and soft to the skin and produce amazing results.